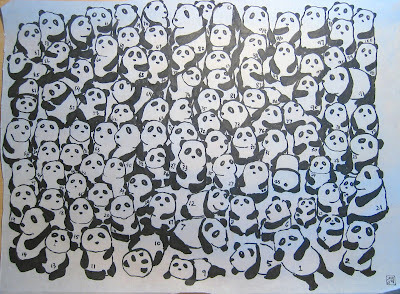 At first, I was just gonna practice drawing more pandas by following the instructions on the chinese-tools site… then I came across this post on Stefan G. Bucher’s DAILY MONSTER site and thought that maybe I can fill the page with 100 pandas too! So this is what I got after 5 days! This is the first piece of work that took me so long :P feeling somewhat accomplished though. The “100 pandas” tee is available here! check it out! Panda is the pride of China. I am happy to see that you like the panda so much. If you want to learn more about China, I suggest you learn more about learning Chinese and mandarin, and learn more about Chinese history and culture and make more Chinese friends. How fun! They are so cute and the expressions are perfect. this was worth the time you put into it – it’s a great piece! awwwww yeah! real nice. That IS an accomplishment. It’s a panda pile!